It seems hard to believe that summer is over and school has started. I hope that each of you had a wonderful summer and you have some happy memories to sustain you in the depths of winter. This time of the year holds its own joy as life settles into comfortable routines, markets are flooded with harvest bounty, and nature prepares for the fabulous fall spectacle. For the kids, there is the excitement of buying back to school stuff and looking forward to being with friends they haven’t seen for a while. St. George’s is resuming its normal activities as well. We returned to the three services (8:00 – Quiet; 9:30 – Classic; 11:00 – Contemporary) on September 4. Church School resumed September 11. Stephanie McLean is St. George’s Church School Co-ordinator. The themes this year are Women in the Bible and Fruits of the Spirit. Messy Church resumes on September 14. This month’s theme is “The Treasure in the Field.” Doors open at 5:00, and people come when they are able. There are fun, crafts and, as always, a ‘challenge’ table. Supper will be a savoury beef stew. Stew can be a metaphor for our lives, filled with many good things that God provides, all mixed together to both delight and nourish us. A new program at St. George’s this year is Kid’s Camp on the school PD days. It will be a full day camp from 9:00 to 3:00 and will include lunch. The program includes crafts, skits, games, science activities, and music. 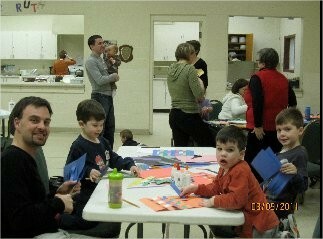 Registration forms are available at the church office (905-877-8044) or go to http://t.co/qO4ngPf. The cost is $15.00 per child. Space is limited. Kid’s Camp is available for kids 4-10. The PD days are Oct. 7, Nov. 18. Feb.3, April 27 and June 8. You may register for one or more days. For young parents with new babies St. George’s offers “Baby Talk.” This is a free Drop-in to meet other parents with new babies and chat in an informal setting. There is a UK trained midwife and breastfeeding counselor available. Baby Talk is from 10:30-12:30 on Fridays at St. George’s beginning on September 9. On September 25 St. George’s will be joining other Anglican Churches in Back to Church Sunday. People are invited to bring a friend, or, it you have not been in a while, this would be a good Sunday to came back. Come, celebrate God’s blessings in your life. Hope to see you at St. George’s or the Farmer’s Market or just out and about in Georgetown. Next Post Antiques Appraisal Show Coming to St. George’s!